She must MUST have shoes ! This princess is making me want to go out, buy myself a Barbie doll (why not?) and start crocheting Barbie clothes again 🙂 Aah, I miss those days. We had to give away all my daughter’s dolls for the move to Melbourne and now that we’re back, my daughter (eldest) is only into KPop bands. Great work on the crown. And, have fun in Switzerland 🙂 No travel plans for us yet, still waiting for the little one’s passport. 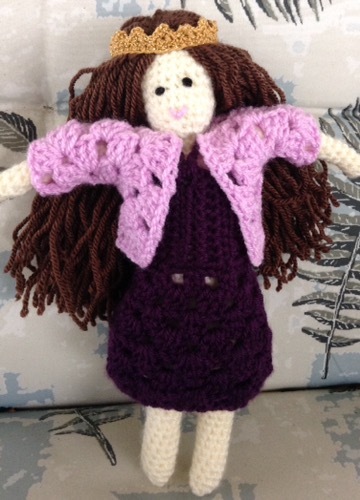 I have inspired a friend at Knit night to make a couple of dolls for two little girls she knows too. This pattern is simple but the tubes for the legs and arms are fiddly. My reasoning for not doing shoes: I’d have to sew them on and then when she was wearing her paper bag dress they wouldn’t look right! I love how you can remember when and where you bought the 1.5mm crochet hook! 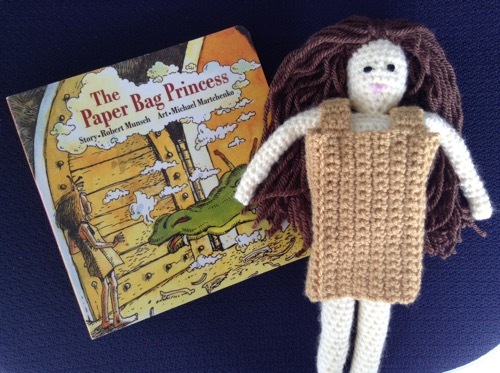 …..and travel plans – I’m going to the Netherlands for a doll making conference to learn how to makes heads from my favourite doll maker ‘Mum & Dot’ …..I’m ridiculously excited! From your blog, it looks to me like you’ve already perfected the dolls’ heads! I remember buying the crochet hook that year because my boyfriend and I were on a six month backpacking tour of the Greek islands and we stayed about three months in one little Cretan village where I wanted to make some extra drachmas. So I bought the hook and some crochet cotton and made little motifs. Never did sell any!